The last of our series of blog-posts ties together the visions of leadership in Irish libraries presented by our inspiring speakers at Lead to Succeed and is written by CDG Chairperson Marta Bustillo. This year’s annual seminar and AGM of the Career Development Group sought to present a variety of views on leadership from librarians at all career stages, as well as from non-librarians. We invited John Lonergan, former Governor of Mountjoy prison, as our keynote speaker and we also had Kate Kelly, head librarian at RCSI; Siobhan McGuinness, 2016 winner of the Career Advancement Award from the Special Library Association’s Leadership & Management Division; Hugh Murphy, Senior Librarian at the Collection Management Division in Maynooth University Library, and Marie O’Neill, head of library services at Dublin Business School. All of them came at the issue of leadership from very different angles, yet a number of common themes seemed to emerge from all of the talks, which I would like to reflect upon in this post (slides available at links above & on our Slideshare). At a time when even the need for libraries is being put in question, and when library staff are increasingly being replaced by so-called ‘open libraries’, effective leadership will make the difference between a thriving and well funded library, or no library at all. Hugh Murphy asked: “a leader of whom? In what?” These are unequivocally the core questions we should ask of ourselves and of our profession. If we want libraries to flourish and play a central role in society, we must provide visionary leadership that can demonstrate the value and relevance for the future of what libraries offer and what librarians are trained to do. However as Marie O’Neill highlighted, where are our role models for leadership? Do we know sufficiently about the history of our profession to understand who our leaders were, and what they contributed to the world as we know it now? How many working librarians can actually name the founders of our profession and why what they did was important? As a profession, we have remarkably little knowledge of our own history, of our own successes, and find it particularly difficult to adopt a style of leadership that works for ourselves and for our institutions. This of course could change if, as Marie suggested, we introduced modules on the history of our profession and on developing leadership into the LIS curriculum. Nevertheless, we would probably still come up against what could be considered as character traits of librarians: the unwillingness to ‘blow our own trumpet’ and the preference for keeping a low profile. As Kate Kelly highlighted in her talk, the ‘vision thing’ is difficult to achieve, particularly, it seems, for women, in a profession predominantly populated by women. It requires influencing and persuading ‘up, down and sideways’, something that librarians are rarely trained to do. John Lonergan defined leadership very clearly when he said that it is about taking responsibility for everything that happens in an organisation. It requires integrity, vision, the ability to get the best out of others and the humility to acknowledge mistakes. Without integrity, nothing else will work because staff won’t know what is true, what is expected of them and whether leaders can be trusted to stand by them when things get difficult. Without vision, staff won’t be enthused about their work and will not contribute their most creative ideas. Leaders must be committed to getting the best out of others, fostering an equal and respectful atmosphere at work, making good use of the expertise that staff bring to their positions, recognising the achievements of their employees and investing in their personal and professional development. When they fail to do so, this translates into high staff turnover and losses for their organisations. Finally, leaders must have the humility to acknowledge mistakes in order to foster a trusting relationship with employees, one which encourages staff to report the failures as well as the successes, and to try even when they may fail. The CDG’s seminar was meant to start a conversation about leadership in Irish libraries, and certainly our five speakers achieved this very successfully. Now the question is where we go from here: what do we need to do in order to encourage leadership at all levels, to train leaders and to foster a culture of leadership in our libraries? Watch this space – we hope to organise more events in the future that explore the concept of leadership and train future leaders. Bushe, G. R. (2013). Kessler, E., ed. ‘The Appreciative Inquiry Model.’ The Encyclopedia of Management Theory. Sage Publications. Following our highly engaging event Lead to Succeed: a vision for Irish libraries on Friday the 14th October in the RCSI, we have split our recaps and reflections into a series of three blog-posts to be released over the coming days. Today’s recap on the keynote speakers was written by committee member John Wheatley. Former governor of Mountjoy Prison, John Lonergan, got the day’s event off to a start with an engaging and light-hearted talk entitled ‘Getting the best out of others’ in which he spoke about his philosophy of leadership and its application in the workplace. While the impenetrable fortress of Mountjoy Prison may well be a far cry from the leafy environs of the likes of Maynooth or the Royal College of Surgeons on Stephen’s Green, the principles of leadership, nevertheless, are similarly applicable in the library context. Staff members, prisoners, students, the general public – all are stakeholders. John emphasised the importance of maintaining respect for all stakeholders: subordinates and – in Mountjoy’s case – prisoners alike. A disconnect is all too often apparent between senior management and entry-level, front-line staff members. Humility, both intellectual and social, is key to removing this sense of disconnection. Leaders must understand that every single member of staff has a role to play and should be treated with dignity. He stressed the need to adhere to the principle of fairness and to behave consistently. “Nobody likes criticism!” On the subject of constructive criticism, he expressed doubts as to its merits, questioning the ultimate value in telling someone that they’re “a thundering eejit, but…”. The talk was rounded off with an appeal for a more human style of management, a common sense approach. Simply by smiling and being nice to colleagues, the work environment can become much more enjoyable. In the library sector which increasingly reflects a corporate-like ethos, it’s easy to forget the importance of harmonious relationships built on mutual respect and understanding. The next speaker to take to the stage was Kate Kelly, Director of Services of the RCSI Mercer Library, who spoke about the role of leadership in transforming vision into reality. Beginning her talk (entitled ‘Beyond vision: making it real’) with the assertion that leadership is not linear, but fluid, she elaborated by linking leadership to innovation. The capacity to turn vision into reality is a defining characteristic of great leaders, or, to quote Warren G. Bennis, “Leaders must encourage their organizations to dance to forms of music yet be be heard”. “Soft” or “people” skills and emotional intelligence were cited as amongst the most important leadership skills needed in the workplace today. As library and information professionals, there is an understanding that we need to re-associate the word “library”. Information technology has had a transformational effect on the traditional library and imparting vision to embrace change is key to the library function retaining its relevance. By facilitating an environment conducive to experimentation, the culture of leadership in the organization can promote a “healthy anxiety” which can allow for the emergence of leaders at all levels. Leaders must be able to articulate the vision of an organization and, rather than planning, must take strategic action, effectively bringing the operational and the strategic together. Rather than equate strategy to planning, all action should be strategic. All action becomes strategic when there is organisation-wide buy-in to a defined strategy. This buy-in is achieved through influencing, risk-taking and engagement. Vision, thus, becomes reality rather than the vague, over-arching aspiration of a mission statement. “Begin with the end in mind” and “Life is what happens to us while we’re busy making other plans” – two quotes worth keeping in mind! It is the leader’s role to add detail to the “bigger picture” by assuming a role that rejects passivity and implements ownership and accountability. Inspiration can be taken by scanning the environment, especially outside the sector. Kate also spoke about how library buildings can act as physical manifestations of the vision of the organisation. Implicit in this analogy is the library as the epicentre of organisational activity: the symbol of and catalyst for change. Need an inspiring library event to ease you into Autumn? 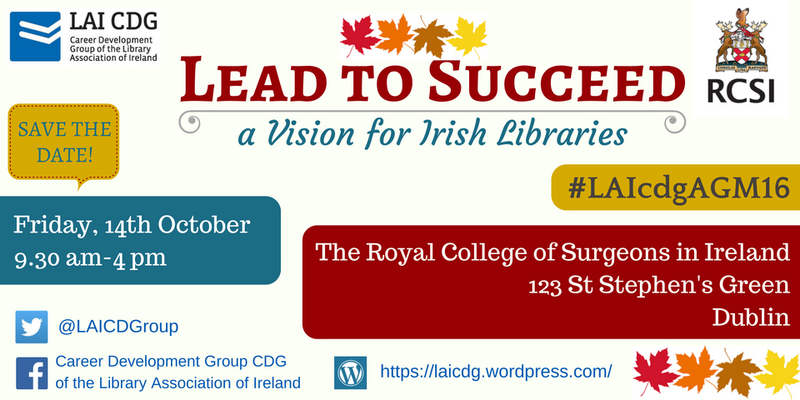 The CDG is proud to present this year’s seminar/AGM in association with the Royal College of Surgeons in Ireland Library – Lead to Succeed: a vision for Irish libraries. This half-day seminar will focus on sharing experience and knowledge in Irish libraries with a focus on leadership in times of change. It will be opened by keynote speaker Mr. John Lonergan (former Governor of Mountjoy Prison) who speaks passionately on social-justice issues, the importance of maintaining a work-life balance and community-building within your organisation. We’re also excited to announce speakers from four different Irish libraries and further details will be released here over the next few weeks. Lunch will be provided and you’re welcome to head off after or stay on for the LAI CDG AGM 2016 with reports by committee officers on a busy year of events and activities as well as our plans for the future, and of course our ritual networking in the local pub! Get your tickets now so you’re not disappointed! Despite its name Library Camp does not imply camping in a library with a sleeping bag and a tent! It’s known as an “unconference” – an informal gathering where experienced and new professionals alike share their ideas; or it can be seen as a springboard to your future in public speaking! The Career Development Group in collaboration with the Academic and Special Libraries group of the LAI (A&SL) have been organising library camp since 2013. Thanks to DBS Library, this year the LAI CDG and the A&SL were able to hold library camp at Castle House in the Common Room on 21st May. The venue got the thumbs up by attendees, with bean-bags and comfy sofas widely appreciated – according to the tweets on the day! On Twitter the event ranked fourth in Dublin for a while! Past camps used to start with a speed networking type of session to break the ice amongst participants. Instead this year a quiz was introduced with prosecco for everyone in the audience. The questions covered general knowledge and only one was about librarianship. The innovation was approved by seasoned attendees and by newcomers alike. The lucky (aka the nerdiest) team – Going Postal – won a golden ticket for a free entrance to one of next year’s LAI CDG events. After 3 rounds there was only half mark of difference between the first two teams. A combination of prosecco and networking made the game highly competitive amongst the 8 teams! Then being slightly chirpy but still focused, it was time for the first set of pitches. The marketing campaign for lib camp generally includes the theme and starts a couple of months before the date. This year the subject was a direct question: Are all librarians teacher librarians? Pitches are emailed to the LAI CDG for approval – there is no need to set up a group of slides, because a pitch is carried out with a flip chart, a marker and any other prop selected by the pitcher. Being an open space event, participants can wander in and out of a pitch as they pleased. This year there were so many pitches that it was decided to run 4 pitches at one time, to give each one an opportunity to speak. Each pitch tends to be very lively; it lasts approximately 30 minutes and if you feel lonely you could ask a colleague to co-host. In three years there have been pitches with games, with group work and some with animated discussions. If you pitch or sit at a pitch you won’t have time to get bored at Library camp! Library camp is known for baking an interesting pitch to entertain a small group of participants and also a cake (savoury or sweet) to help fuel the hungry crowd. However, for those who are timid at showing off their baking skills, there is always the option of topping up the wide variety of food (or drink) items brought in for the occasion. The brain needs to be fed to function properly and to face the rest of the pitches lined up for the day! This year it was worth a king’s ransom sitting on a bean bag or on one of those sofas in the Common Room, sipping away at prosecco or tea/coffee, stuffing your face with so many goodies and your brain with a mammoth of useful info about teaching and librarianship. So roll on next year’s edition! For more, see our Storify of the event here, our friends at SLIP’s Storify here, and the CDG Flickr account for more photos! Presenting at Library Camp this year was a very different experience: last year I was in the middle of my wonderful six-week work experience placement, in the Cregan Library in St. Patrick’s College, DCU; this year I pitched from the perspective of a library advocate, with an outside perspective and opinion, on how librarians should use networking, and cross-discipline collaboration, to further their role as teachers. The afternoon was both interesting, and most definitely, rewarding. I put forward my thoughts and observations below. Librarians, you do a very valuable job: ‘May the Force Be with You’… Always. I passionately believe that in a true republic, where education should be available to all of the people, equally, libraries are both central, and essential. However, I have been thinking that librarians should be involved wherever, and whenever, possible in the wider skills/ teaching/academic world: at local/grass-roots level, in addition to a national level. People on the floor/at the coal-face are powerful, and need to feel engaged and empowered. Having followed various #’s of library/information, academic/student, and Career/Guidance Counsellor’s workshops/conferences, it seems to me to me that there is room, and indeed a need, for a coordinated approach from all stakeholders. My pitch mentioned such things as the ‘T-shaped’ graduate and ePortfolios as an example of how, and why, librarians need to network, and join the conversation in associated arenas, with associated stakeholders, in order to demonstrate viability and secure their future. Librarian Get Loud…Get Involved…if you are involved Get More Involved! If you get a chance to look through the feed from the #eportfoliohub16, and you’ll perhaps be struck, as I was, regarding the similarity of ideas, concerns, and motivations with some of those at #lilac16. Librarians need not only to get LOUD, but, in these days of adaptability/innovation, should be leaders in reaching out to other interested parties regarding these issues. Ok, let’s think big here…Imagine what could be achieved through a coordinated workshop, moving to a full-on conference and road-map/agreed or imagined approach? Library/information professionals are under pressure to make their positions relevant, imagine if librarians could become involved in something like the research/composition of Eportfolios for example? Using all your research/teaching expertise, giving you access to another department within an organisation, opening the door to administrative, training, HR and academic departments, and the students/colleagues therein? Also, it would further diversify your role…. Having worked in a commercial environment myself, I really believe that to innovate, and diversify is crucial to survival, and a means to show the value of the service been given. Synergy is a given in business. Are the LAI or associated institutions represented/present at conferences such as Career Guidance, NALA, various Professions or Teacher’s conferences? Do these important and influential bodies know how progressive librarians are? Have any of their reps been invited to CDG initiatives, Librarians ALOUD, LILAC 2016? Not necessarily to present, just to attend…. Do they know what you are doing, what you can offer, what wonderful allies you can be? ‘An e-portfolio is a purposeful aggregating of digital items – ideas, evidence, reflections, feedback etc., which ‘presents’ a selected audience with evidence of a person’s learning and/or ability.‘(Sutherland and Powell, 2007). Paper-based portfolios have been used in education for many years. In recent times the electronic portfolio or eportfolio has emerged as a preferred option, allowing portfolio owners to take advantage of digital technologies, often supported by specific eportfolio software. This three day workshop event, which takes place in DIT Aungier Street, will explore themes such as ePortfolio projects, tools and platforms, assessment and reflection, and digital identity and career progression. DIT, ITB, ITT and Hibernia College, along with the support of the National Forum for the Enhancement of Teaching and Learning, are delighted to host a National Irish ePortfolio Workshop event ‘ePortfolios in Ireland: What Now, Where Next?’ on 21st – 23rd March, 2016. LILAC16 — same dates! – Was there a library/information specialist at DIT conference – not necessarily presenting, just attending, what did they think? Concerns are growing that education systems are failing to equip students with the knowledge and attributes they need to flourish in the workplace. Following extensive consultation with employers nationally and internationally, we identified six key attributes (including communications, leadership, problem-solving, innovative mind-sets, global awareness), underpinned by specific proficiencies (such as digital literacy), that are fostered in all our students. [DCU] From this year, all incoming students will be provided with an e-portfolio that will act as a digital archive of personal development and will be framed around the headings of the six generic attributes. What’s happening in your institution? Following Twitter, it appears that the same people/interested groups are talking, and interacting with each other, which is fab, but is it time that other associated groups, from outside the library sphere also joined your conversation…or are reminded to include you in theirs? #Futurelibrary Vs. #wordcon (writers/literary conference) same day…being held in the NLI!) … ASTI conference also happening! Was there a library/information specialist at these conferences? What did they think? Was there a writer/literary festival volunteer or expert/teacher at #Futurelibrary? What did they think? But How?!! Engagement with associated professional fields, or advocacy groups. Show & Tell! Real: Invite them to your workshops, think-ins, dare I say it, conferences: go to theirs! Two for one entry? Bring a friend initiative? And then, slowly, but surely, build on those relationships, expand what you’ve done in library/library school circles to neighbouring organisations! You owe it to yourselves, and to future librarians/information specialists. You have to show that your teaching initiatives, indeed, your library, or your role within an organisation has merit, and consequently receives the funding and recognition it deserves…it is within your power. Start the conversation, engage, show your knowledge, and show how you can help: take advice, observe what is going on in associated spheres. Learn as well as teach. Show that Libraries are friendly allies, not the conquering or vanquished enemy: not a Trojan horse! The Twitter group #EBLIPRG (Evidence-based Library and Information Practice Reading Group) began in August 2015, led by Suzana Sukovic, Fiona MacDonald and Liz Walkley Hall. They were inspired by the conversations that they’d had at the EBLIP8 Conference, and wanted to find a way to continue their discussions. And so their Twitter reading group began – a first for the Australian library community! (For the full back story, see here). Check out #EBLIPRG on Twitter for a quick idea of what it’s all about. If you’re new to Twitter chats you can find out how to participate here, but the short story is it’s a great way to connect with other library professionals, researchers, students within your own network and around the World – anyone who’s on Twitter can have their say! Get online at 11am on Thursday 30th June and lurk, listen, join in! Make sure to use #EBLIPRG in your Tweets! Pan, Denise & Howard, Zaana (2010) Distributing leadership and cultivating dialogue with collaborative EBIP. Library Management, 31(7), pp. 494-504. 1. Do you think the experience and knowledge of library staff is utilised by library management to make decisions? 2. The article describes a reorganisation of library staff and workflows to flatten the hierarchical structure & better reflect library priorities. Have you ever worked somewhere with a shared leadership culture? 3. What obstacles prevent a shared leadership culture from thriving? 5. Have you or your organisation ever used an appreciative inquiry model to research your workplace, and if so, what were the results? 8. The article acknowledges library personnel as assets by recognising that when libraries maximise the talents & skills of a diverse staff the organisation becomes responsive & innovative. Discuss. LibCamp 2016 Programme is complete! 12 great pitches complete the programme for the afternoon with 4 happening at once! 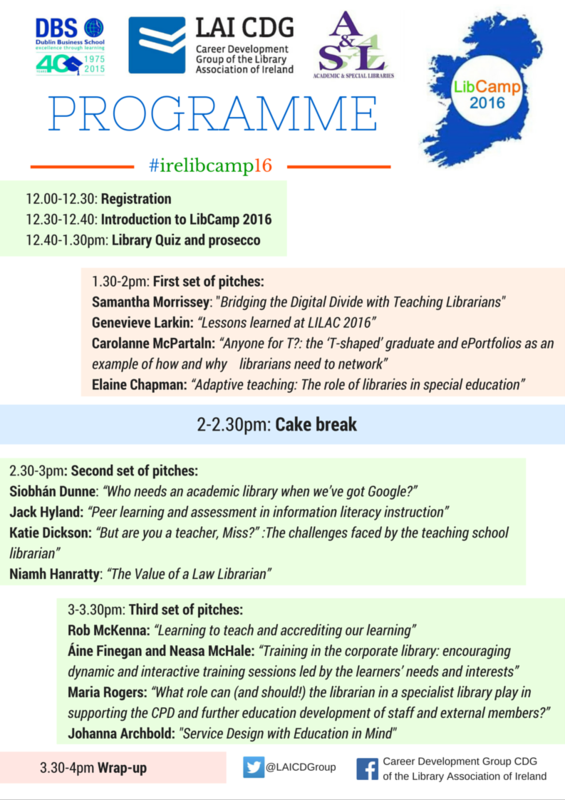 Our amazing programme of pitches for #irelibcamp16 is now full and we are delighted with the variety and quality of the pitchers (see below)! We’ll continue to sell tickets until we’re sold out but make sure to book your place soon to hear from all these great librarians and library advocates on how libraries can and do interact with teaching and learning in different settings! Author laicdgPosted on May 17, 2016 May 17, 2016 Categories LAI CDG, LibCamp 2016Tags A&SL, Events, fun, irelibcamp, Library CampLeave a comment on LibCamp 2016 Programme is complete!